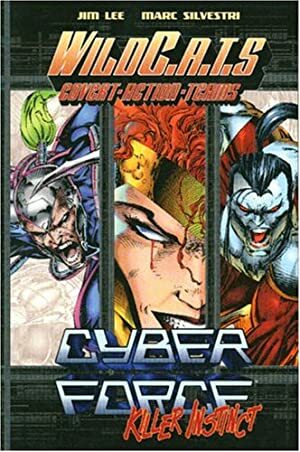 Cyberforce was one of the 1993 titles as red-hot, brand new publisher Image Comics was taking the super-hero comic book world by storm. It was created by one of the founders, Marc Silvestri. This book and its spin-offs became the Top Cow studio and universe, splitting off from the brief-lived shared Image universe. Misery appeared very early in the Cyberforce run. Known Relatives: William (Father, Deceased), Jim (Lover, deceased). Group Affiliation: Cyberdata’s SHOCs, Gamorra Corporation. Base Of Operations: Cyberdata, Gamorra’s Isle of the Deads, Mobile depending on the period. Height: 5’10” Weight: 155 lbs (BISEY weight of course). Misery is a mutant with powerful empathic powers. She can provoke such hatred or love in anyone’s mind that he could kill or be killed for her. After she first died by the hand of the WildCATs Warblade, Dr Richtoffen (a rogue brain of Cyberdata) reconstructed her as a BISEY (Bio-Synthetic) unit. 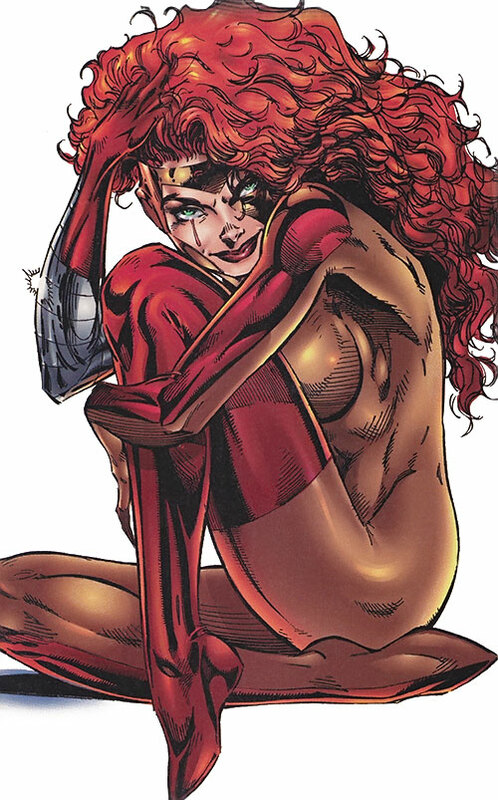 She kept her former empathic powers and developed even more mental powers (in DC Heroes RPG terms, Force Shield and Mind Blast). As a BISEY, she’s much more resistant and immortal. But she doesn’t know it. She still believes that she never died in the first place. Though her body is cybernetic, she doesn’t have any advantage or drawback, except for physical durability, that a robotic body has. We can fully assume that her mind is still human, as she still has feelings. So she’s not really immortal as her mind will feel debilitation in time, even though her synthetic body will not age. Lydia was born in Leedey, Oklahoma from an Irish Catholic family. Her dad worked as an executive in a nearby petrol refinery while her mother was not so… devoted. Indeed, William burned his wife and her lover to death when he learned of their relationship, sending them “burning in Hell”. By the age of 17, Lydia was the lover of a colleague of her father, Jim – who was married with children. She got pregnant, which pissed her father to the point he threw his religious beliefs by the side to convince her to have an abortion, still quoting her mother’s purity. Mr. O’Rourke had also been keeping a lid on some illegal activities at the refinery. This gave the evil corporation Cyberdata, who had taken over the plant, enough leverage to make him destroy the facility in a fire. Jim overheard about the plot, and tried to get in the way. He was killed by Lydia’s father when he understood he made her daughter pregnant. Witnessing the murder, Lydia realized her father killed her mother and now her lover. It’s at this time her powers truly awakened (may be due to the psychological trauma). So she froze him in the middle of the blazing inferno he had lit to destroy the refinery. That’s when Richtoffen drafted her in Cyberdata’s SHOCs. As a SHOC, she messed with her male teammates feelings. First she took over Warblade, then dumped him, then she put her grab on Ripclaw, fueling her former lover’s jealousy and her current one’s mistrust of the ex. Because that’s just the way she likes men, arguing and fighting each other for her attentions. The SHOCs were sent to retrieve the rogue Richtoffen and the technology he had taken with him. But Misery sided with the cybernetician and killed the SHOC troopers accompanying them. Warblade witnessed that and immediately jumped to her throat. In the ensuing fight, he killed her. Ripclaw, mad from his lover’s death by his rival, threw him to his death down the cliff they were fighting on. Unknown to him, Warblade was not dead. He was rescued by Lord Emp and would become one of the WildCATs. Meanwhile, Misery was reconstructed as a cybernetic unit by Richtoffen. Years later, the WildCATs entered the scene to put an end to Richtoffen’s activity. The man was indeed a Daemonite as well as the head of the R&D department of the Gamorra Corporation. Furthermore, he had been trying to acquire the Kherubim COS 7 BISEY (Cybernetic Operations System 7 for Bio-Synthetic units). He wanted to steal the code from android WildCATs member Spartan. The goal was to make perfect hosts for Daemonites on Earth. Misery stood in the way, taunting Warblade to fight her. As a result, Warblade had to be left behind by his fellow WildCATs while they were evacuating the research center, which self-destructed. When the WildCATs came back to retrieve their friend, Misery teleported out to a place where she made Warblade and Ripclaw fight all over again for her. Then reinforcements arrived, and the WildCATs lined up with Warblade while Cyberforce backed up Ripclaw. This lasted until Warblade managed to put a well placed claw through Misery’s chest. At this point, she realized she was no longer human. She dropped her empathic manipulations of Cyberforce, asking Ripclaw to do her a favor and kill her for good. Ripclaw, being the caring type we know him to be, complied against his feelings, and both teams made peace. (Back during these early years Lee and Silvestri could still work together at Image Comics. In fact, it was the first Image Comics crossover ever made). But that was not the end of Misery. Cyberforce crossed her again when she -again- attracted Ripclaw in a sucker play after the official fall of Cyberdata. Somehow, she made up with the remnants of the corporation to turn Ripclaw to them for another cybernetic experiment. Never heard of her since. She is a striking Irish-American lass. Her long red hair are curled. She wears a half red, half orange body glove. Her right arm shows some kind of steel grey layered armor plating. Beneath her right eye is a blood tear dropping on her cheek. Whether it’s a tattoo or a permanent effect of her powerful mind powers is unknown. Misery is a user, and an abuser. She just loves to play with the attraction she provokes in men. She doesn’t like men when they’re not at her feet. If necessary she uses her empathic powers to make them just do that. Force Shield is only effective against range attacks (-1). Invulnerability only works on physical damage (+0). Attractive, Lightning Reflexes, Rich Friend (whether it’s Richtoffen, Kimata or someone else depends on the period, but she can afford that). Ripclaw (Low), Gamorra (Low), Richtoffen (High), Kimata (Low). Arch Enemy (Warblade), CIA (Playing with people feelings), SPI (over BISEY condition). I picked SPI for her problem with her BISEY condition. I just thought Traumatic Flashback was too strong. Any suggestions welcomed. Source of Character: Images Comics (Top Cow Universe).